Jack Crow heads a team of professional vampire hunters employed by the Vatican. 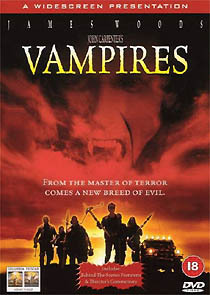 Vampires marks something of a return to form for one of the genre’s most talented directors, thanks in no small part to a charismatic performance by James Woods, and good support from Twin Peaks' Sheryl Lee. Columbia’s Region 2 DVD offers the film in widescreen ratio, enhanced for 16:9 sets. The sound is 5.1 Dolby Digital, which adds considerably to the atmosphere. The disc features a commentary track by Carpenter which is often enlightening, and fans of the director will definitely want to check it out. The UK disc features a six-minute behind the scenes featurette, featuring location footage and interviews, which doesn’t appear on the American version.